A SmartCoin is a cryptocurrency whose value is pegged to that of another asset, such as the US Dollar or gold. SmartCoins always have 100% or more of their value backed by the BitShares core currency, BTS, to which they can be converted at any time at an exchange rate set by a trustworthy price feed. In all but the most extreme market conditions, SmartCoins are guaranteed to be worth at least their face value (and perhaps more, in some circumstances). Like any other cryptocurrency, SmartCoins are fungible, divisible, and free from any restrictions. Cryptocurrencies are unique in that they are the only digital currency that is not someone else’s liability. They are fungible, decentralized, and as valuable as the network of users that support them. Unfortunately, they suffer from very high volatility, because their perception of value constantly changes as users enter and leave the ecosystem. The traditional approach to creating a stable asset is to accept deposits and issue a digital token as a claim receipt. Under this approach, the token is valued by the market as a dollar, discounted by any credit risk associated with the issuer. This can work well for transactions, but less well as a form of savings. History has repeatedly proven that issuers eventually go bankrupt due to fraud, incompetence, or government intervention. More recent approaches have used a cryptocurrency as collateral in a contract for difference. Under this approach, two parties take opposite sides of a trade, where one party is guaranteed price stability, and the other party is granted leverage. This approach works as long as sufficient collateral exists, and the contract can be settled by an honest 3rd party with a price feed. Unfortunately, a contract for difference is not fungible, and has an explicit settlement date, which means it is not useful as a currency. Bitshares is one of the most unique and innovative of the ‘Bitcoin 2.0’ projects seeking to use block chain technology for more than just creating a digital currency. It is a ‘Decentralized Autonomous Corporation’ whose owners (anyone who owns any BTS, the system’s native cryptocurrency) elect a board of 101 ‘delegates’, who serve as the company’s board of directors. At its heart is the Bitshares decentralized exchange, which can be used for trading various assets, including assets which track the value of ‘real world’ currencies, commodities like Gold, or a digital currency like Bitcoin, without the need to trust your wealth to a central bank or exchange. Like any financial market, there are plenty of opportunities on the Bitshares decentralized exchange for traders to make themselves a profit, or a loss, depending on their performance. In this article you will find a beginner’s guide to using the Bitshares wallet to try to make a profit from trading. The main feature of the Bitshares exchange is something called ‘BitAssets’. These are market pegged digital assets whose value is tied to that of a specific asset outside of Bitshares. To put it more simply: 1 BitUSD is designed to always be worth 1 USD, 1 BitEuro is designed to always be worth 1 Euro, and so on. This works for commodities, such as gold or oil, just as well as it works for currencies like the USD or Euro or a new digital currency like Bitcoin. You can view the full list of available assets from your Bitshares wallet. The mechanism which keeps the price of the BitAsset the same as the price of the external asset which it is tied to relies on traders using the decentralized exchange, in their own self-interest, in the hope of making a profit. If you decide to put what you learn in this tutorial to use, then you too will be contributing towards maintaining the market peg of any asset which you trade. This works through something called a ‘prediction market’, in which traders open positions according to whether they think the value of the asset will rise of fall relative to BTS. Using this prediction market you can either buy a BitAsset, in which case you will earn interest just for holding on to it, or you can ‘short sell’ the asset using BTS as collateral. To short sell means that borrow an asset in order to instantly sell it, thinking that you can buy it back for less money in the future and therefore pay back your debt and make yourself a profit. All BitAssets which exist are ‘borrowed’ into existence like this. The decentralized software acts like a deCentral Bank, creating the asset in order to lend it out in the same way that our banking industry creates fiat money when it makes a loan. But unlike the traditional banking industry, for the Bitshares system to lend you a BitAsset you must have BTS coins worth 4 times the value of what you want to borrow, and this BTS will be locked up by the system in order to automatically cover the cost of repaying your loan if the market moves against you. When you ‘cover’ your loan, which means repaying it, or if the system is forced to do so for you using your collateral , the BitAssets that you created when you made the short sell are destroyed. You can also use the decentralized exchange to trade user issued assets which are not tied to the value of anything else. In order to use Bitshares you will need to get yourself a wallet and create an account. You can download the latest stable wallet release from Bitshares.org. Creating an account requires a small amount of BTS which you can get from the Bitshares Faucet. You can have as many accounts as you like and each one can keep its own separate balances, but having too many accounts running on the same machine can be an excessive drain on your computers resources, potentially slowing it down or causing other problems. Buying BitAssets such as BitUSD, BitCNY or BitSilver is actually very easy to do. You will need to have some BTS, as this is the native cryptocurrency for Bitshares and the base currency of the decentralized exchange. You can buy this from various different exchanges such as Poloniex.com. When you are ready click the ‘exchange’ tab on the navigation bar along the top. You will see a search box, some information on featured markets, and then a list of different assets you can buy or sell. Click on the asset you want to trade followed by the blue button saying, for example ‘trade USD/BTS’. You should now see a couple of graphs showing price history and some key information like volume and latest price along the top. Underneath this you will see all the buy, sell and short sell orders currently on the market. Along the left you will see some tabs and a form which you can use to buy, sell, short, or cover yourself. To buy or sell all you need to do is to take a look at the offers already on the market, and perhaps the call price (provided by delegates based on the BTS exchange rate from more traditional exchanges) and then enter in the amount you want to buy or sell along with the price you want to pay – it will automatically calculate the total price for you. You can also type in the total amount you want to spend, and let it calculate the how much you can buy at your given price. If there is nobody willing to sell at that price your offer will stay on the market until it gets filled, or until you cancel it. Your open orders will appear underneath the order form along the left hand side. They are colour coded to match the tabs – green for buy orders, red for sell orders, blue for short sell orders. You get paid interest for any BitAsset which you own. The exact amount depends on the people who borrow it into existence using the short sell feature described below, so less popular assets may have a higher rate of interest to tempt buyers into making a purchase. This interest will gradually increase over time and is paid to you when you eventually the sell your BitAsset. If you are a long term ‘buy and hold’ investor, however, please remember that there is an inactivity fee levied on accounts which aren’t used for over a year, so please make sure that you log in from time to time and make a small trade, even if its just transfering 1 bts between a couple of your own accounts. 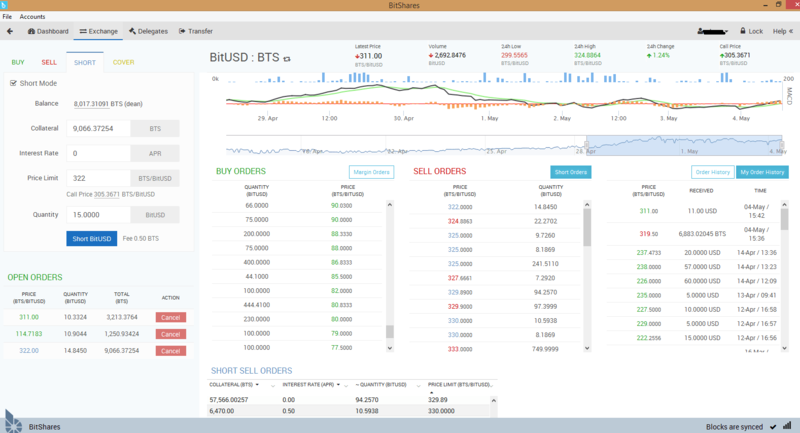 Screenshot of the Bitshares wallet trading screen. Short selling a BitAsset such as BitUSD is a little bit more complicated than buying or selling, but its still fairly easy once you know what you are doing. By short selling you are effectively making a prediction that the value of the asset will go down relative to BTS. You might do this because you think the asset itself is overvalued, but you may also do this as a way to profit from rises in the price of BTS – so for many people this is an additional way to profit from the success of Bitshares. Interest Rate: This is the annual rate of interest you are willing to pay to whoever owns the asset you short into existence. You pay this when you ‘cover’ your short by buying the assets you owe to the system on the open market and repaying your debt. Collateral: This is the BTS held by the system to pay your debt for you if the market turns too far against you – it means you can’t be left unable to pay your debt. Its automatically set to 2x the value of the assets you want to borrow. For example, if you want to short 10 BitUSD you will need to have $20 worth of BTS to put into collateral. You cannot change this – it will be automatically filled out when you choose how many of the asset you want to short, or alternatively you can fill out the amount of collateral you have and the system will calculate how much of the asset you can short. Price Limit: You can leave this blank if you like, in which case you will execute a short sell at market price whenever a buyer is willing to pay market price and you are offering the best interest rate. Alternatively you can specify at exactly what price (or better) you are willing to short sell. Then you just need to click the short sell button! If you call it wrong and the value of the asset goes up too much against BTS then your collateral may be used to automatically buy enough of the asset to cover your debt. If you click the cover tab you will see a list of all your open shorts. Each one will have its own ‘call price’. If the delegate call price shown near the top your wallet hits the call price of one of your shorts then this automatic sell off, called a ‘margin call’ will take place. You can also buy the asset at any time and then use it to cover one off your shorts from this same tab. To ‘cover’ just means to pay back your debt and close your position. If you want to see the current short sell orders and approaching margin calls on the orderbooks from other people then you need to click the boxes for them next to the buy and sell orders. Now go and enjoy some profitable trading! Anyone with BitUSD can settle their position within an hour at the feed price.The least collateralized short positions are used to settle the position.The price feed is the median of many sources that are updated at least once per hour. Short positions never expire, except by hitting the maintenance collateral limit, or being force-settled as the least collateralized at the time of forced settlement (see point 2). In the event that the least-collateralized short position lacks enough collateral to cover at the price feed, then all BitUSD positions are automatically force settled at the price of the least collateralized short. A simple metric for testing the validity of our claim that 1.00 BitUSD is always worth at least $1.00 is to demonstrate that, if you can find someone willing to sell 1.00 BitUSD for $1.00, that it would be the cheapest option for buying BTS. This means that 100% of the buying demand for BTS would be available to give liquidity to BitUSD holders as a priority over BTS holders. In the following sections I will attempt to prove that this condition is met. While the rules are simple, the consequences are less obvious. Let’s analyze this from the perspective of the various players. When deciding a price at which to enter a short order, a trader must consider the risk of forced settlement. In this case, no trader will attempt to short at or below the price feed, because they could be forced to settle at the price feed. In fact, a smart trader would allow enough of a spread to account for the risk of being forced to settle at a feed price that was off by a small amount. In practice, the risk posed by the feed error is balanced equally between being in the favor of the short and in the favor of the long, leaving only the risk of being forced out of their position at an inopportune time. A short can minimize their exposure to the feed by providing enough collateral to keep far above the least collateralized positions, and thus very unlikely to be forced to settle at the feed or at an inopportune time. In practice, the only way new BitUSD enters circulation is if there is someone willing to pay enough of a premium to convince a short to provide guaranteed liquidity at the price feed on demand, while also covering the cost of exchange rate risk. This premium will be higher for the backing cryptocurrency in a bear market, and will be lower in a bull market. Someone who is short has only one way to exit their position: by buying BitUSD off the market. This means that a short must also factor in the risk that the premium may change. If a short position is entered in a bull market with a 0.1% premium, it may be forced to exit during a bear market with a 5% premium. In this event a short position is exposed to both exchange rate of the dollar vs. BTS and the premium risk. On the other hand, a short entered during a bear market with a 5% premium may get to cover during a bull market with a .1% premium. For all intents and purposes, the premium is expected to move in the same direction as the price, and thus speculators who only care about relative price changes can ignore the premium. The very first buyer of BitUSD will have to pay the lowest premium set by the shorters. For the sake of discussion, let’s assume the first BitUSD was created in a bear market and cost $1.05 to create. The holder of that BitUSD has two options: sell it on the market for $1.04, or request forced settlement for $1.00. Clearly, the forced settlement option would only be used in situations where there was a decrease in total demand for BitUSD and there were no offers to buy it above $1.00. As a trader only looking to trade back and forth between BitUSD and BTS, this premium doesn’t matter. Such as trader is exposed to volatility in the premium, but that risk is limited to $0.05 in this example. In practice, the premium is expected to be relatively stable and predictable. A buyer with dollars, looking to buy BTS, knows that 1 BitUSD can be used to buy $1 worth of BTS (plus the current premium). He also knows that this premium can never be negative, because of the option to force-settle at the price feed. In this situation, he can know with certainty that if he can convince someone with BitUSD to sell for $1.00, he can buy more BTS than if he simply buys BTS with his dollars directly. The higher the premium, the more incentive exists to buy BitUSD for $1.00. This means that, in a BTS bear market, the BitUSD price gives the highest premium of the BTS price, and BitUSD becomes the easiest to sell. In practice, the BitUSD:USD market will reflect the premium, and traders will usually be unable to find anyone willing to sell for exactly $1.00. If a buyer is looking to purchase a large quantity of BTS without moving the price, he can start by buying up BitUSD with dollars. This will slowly raise the BitUSD:USD price, which is a signal to other market participants. A careful buyer might be able to avoid signaling the market. Then, after acquiring the position in BitUSD, the buyer can request forced-settlement all at once and get the price feed on the entire purchase. Because all positions and trades are visible on the blockchain, all of this trading activity can be factored into the price, minimizing any potential profits to be made by attempted manipulation. A merchant wants to be able to price merchandise in BitUSD, and obtain real USD in the bank account, in a reasonable time, with minimal risk. In this case, a merchant would place BitUSD on the market at $1 per BitUSD. As discussed, BTS buyers fight for the opportunity to buy BitUSD at that price. A smart merchant might recognize that 1 BitUSD can actually fetch $1 plus a variable premium, and start preferring that customers pay them in BitUSD at face value. An even smarter merchant might offer a discount to customers that pay in BitUSD. Any way you slice it, merchants have a financial incentive to advertise BitUSD as the preferred payment mechanism, because they know that $1.00 is the lower bound on what BitUSD is worth. A customer looking to buy goods and services with BitUSD finds himself paying a premium to acquire BitUSD from the market. This means that customers will prefer merchants that offer a discount equal to the premium paid. On the other hand, the premium is a wash for a customer that earned BitUSD at a nominal value of $1.00. In fact, the only people to whom the premium matters are those who are looking to enter or exit the ecosystem. Once a customer or merchant is within the ecosystem, it is easy to simply trade BitUSD at parity, even if it is theoretically worth slightly more outside the ecosystem. Customers use BitUSD because it provides them the convenience and freedom of a cryptocurrency, and has the lowest transfer fees of any other payment platform. Merchants and customers are free to negotiate the best way to split the premium, and the free market will take care of the rest. In the mean time, all participants can rest assured that BitUSD is always worth at least $1, and can consider the premium for entering the ecosystem as a one-time fee. There is always concern of price manipulation. Someone with a large amount of money on both sides of a trade can use their funds to manipulate the markets and thus the price feed. If the amount of money they lose manipulating the markets is less than the amount of money they can gain by manipulating the price feed, then it will be profitable to manipulate the market at the expense of either the BitUSD longs or the shorts. A low-collateralized short that sees a large force-settlement order requested can attempt to manipulate the markets and thus the feed against the BitUSD holder. The risk of price manipulation is priced into the premium on BitUSD charged by the shorts, and thus should already be priced into the market. If price manipulation became a serious problem that caused very high premiums, then it could be addressed by the price feed producers, who can adopt a moving average over wider time windows to increase the difficulty of short-term manipulation. A variety of algorithms could be used to estimate a “fair price” that keeps BitUSD valued at least $1.00. In practice, a feed producer can observe the BitUSD-to-USD market as an indicator on which way to adjust the feed. Generally speaking, the strategy that the feed producers adopt for controlling the feed should be public knowledge, because the shorts will ultimately rely on it. For the feed producers to change strategies in unpredictable ways could cause losses to both longs and shorts. All guarantees of SmartCoins are subject to the caveat that a SmartCoin can never be worth more than the collateral backing the least-collateralized short position. In normal market conditions, the value of the collateral is always more than sufficient, but, from time to time, markets can rapidly revalue the collateral. If this revaluation happens faster than the short positions can be forced to cover, then all SmartCoins are liquidated at the exchange rate of the least collateralized short position. This is similar to an insolvent bank converting its deposits to equity. Not every short seller will be happy with the rules offer by SmartCoins. Some may want to borrow for a fixed period of time, with higher leverage, and with no risk of being force-settled. BitShares offers these speculators the option to borrow BitUSD on the bond market at interest. The bond market allows speculators to leverage any asset against any other, while lenders earn interest on collateralized loans. A Bond market is the perfect way for the market to establish a yield curve on SmartCoins and free both sides of the market from dependency on the price feed. BitShares offers entrepreneurs an opportunity to create their own SmartCoins with custom parameters and price feeds. User-issued SmartCoin managers can experiment with different parameters such as collateral requirements, price feeds, force settlement delays and forced settlement fees. They also earn the trading fees from transactions the issued asset is involved in, and therefore have a financial incentive to market and promote it on the network. The entrepreneur who can discover and market the best set of parameters can earn a significant profit. The set of parameters that can be tweaked by entrepreneurs is broad enough that SmartCoins can be used to implement a fully functional prediction market with a guaranteed global settlement at a fair price, and no forced settlement before the resolution date. Some entrepreneurs may want to experiment with SmartCoins that always trade at exactly $1.00 rather than strictly more than $1.00. They can do this by manipulating the forced settlement fee continuously such that the average trading price stays at about $1.00. By default, BitShares prefers fees set by the market, and thus opts to let the price float above $1.00, rather than fixing the price by directly manipulating the forced settlement fee. SmartCoins are a powerful tool for everyone from speculators and savers, to traders and entrepreneurs. The BitShares platform provides a toolset with which innovators can experiment to find optimal currency solutions using free market discovery.